Random captcha images are possible. Set “theme”=>”random” in $settings variable of CaptchaComponent.php or in Controller when loading captcha component. Download attached zip file and extract. Copy all files placed in app folder to their corresponding locations. I created “SignupsController” controller and Signup.php model for demonstration purpose. Create a function similar to the following in your controller. This component includes a model file i.e. Model/Signup.php file to demonstrate the use of model validation for captcha input by user. 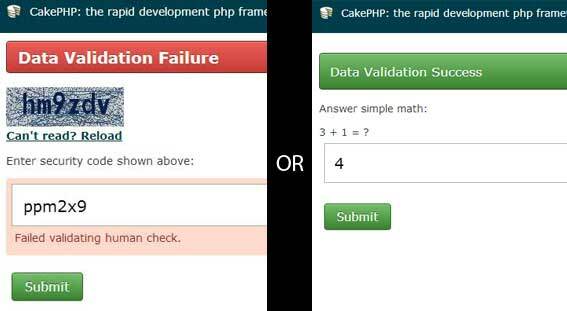 The validation works just like any other custom model validation in CakePHP. I still get spam on my form even if the captcha is used. How come? is there a bug or exploit in it? I even checked to see what the bot entered as the captcha code as is identical as the challange captcha.. help? 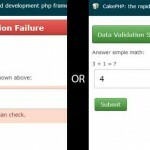 I am using Captcha in cakephp 3 form the ref link “https://github.com/inimist/cakephp-captcha-3”. But image is not comes. Please help me. I have placed properly the code and files in respective files and folders. Still image not comes. How can I use this library for automation script. For test automation. Of is there any other module available for this. Hi, 1st of all, sorry for bad english, i’m french . Error: CaptchaBehavior could not be found. I suspect the “public $actsAs” in my model, but i’m unable to find where is the problem. Could you help me debugging ? I deleted behavior file by mistake. Just emailed you this file. Sorry, i got the solution. There was a space before the open php tag at the begining of CaptchaComponent.php. Sorry, i’m not still getting the error “header already sent” , but the image doesn’t appears. The link to the image returns a code that starts with “ÿØÿàJFIFÿþ>CREATOR: gd-jpeg v1.0 (using IJG JPEG v80), default quality” and follows with an alpha numeric code. But no image. Can you help me? Thanks. i have the same problem reported by other people, i’m getting a “Cannot modify header information” error. I downloaded a new version of Cakephp, installed the component (without any other controller or anything else) and still getting the error. Any ideia? 2: Sorry for my bad English! and i now using this GREAT component without any problem! Good afternoon everyone. I’m using version 2.4.3 on hostgator and captcha image does not work but the maths works perfectly. Another thing: in an action to add, even with the right answer the captcha, I’m being redirected to a blank page. Can anyone help me. There’s nothing in the Apache logs. Your CAPTCHA component helps me a lot. We have used math CAPTCHA in our site. We experienced a bug in it. That is, it allows the user to submit the form when the answer is double quote (“). So, I have updated the validation script (in my model) by allowing only numeric values for CAPTCHA field. Please resolve this bug and it will be useful for all users who all are going to use your stuff. Thanks! I guess you are wanting the user only entering a numeric value in case of math captcha? Actually i cannot say it a ‘bug’. The reason is that, the captcha validation requires the ‘answer’ to be CORRECT so unless user enters the CORRECT answer it wont let pass the form as the validation simply would fail. Or do you say that user can pass the validation by entering a double quote? I don’t see such situation anyways. Interestingly, it is working on my local machine but not on my server. Both GD support and FreeType Support enabled on the server. I just see a broken image. When I open the image link on a new tab this is what I get Warning (2): Cannot modify header information - headers already sent by (output started at /home4/user/public_html/app/Controller/Component/CaptchaComponent.php:1) [APP/Controller/Component/CaptchaComponent.php, line 173] and the rest is mumbo jumbo code. Any idea why? It seems that your code is sending an output to browser before doing the HEADER call. (Check http://ow.ly/prO0G know know what does it mean). Even a space can cause this. Please check your code and log files in order to fix this. It works with imagestring but you may not control the font size. It you want to use this component to show image captcha, using it while “GD enable with Freetype” is recommended. You can show a simple math question as well. Set captchaType=math in settings. dear, ur code helped me a lot, i succeeded locally, but when i uploaded this to server, the image is not coming, i tried to give various path but failed, kindly help me out to sort this. Hi. I have the same problem as Rikita. When i echo debug($code_captach) see a code the image like : . But in normal HTML code image not show. On localhost works fine but on server isn’t show. Have you uploaded font file to webroot folder? The imagettfbox was giving problem. In my case when I was testing on my pc (windows) then localhost://test/captcha was rendering the image properly. But same code was not rendering when I uploaded it to my hosting service (linux). I guess it could have been issue that imagettfbbox could not find the font (though it is present in webroot). and my captcha working fine now. Rest is working fine. Would like to thanks Arvind for useful work. Check php error log for possible errors. I may need to see your implementation of code. Can i see your your code? It works fine with 2.3.5.